A few days ago, I stood in the local big box electronics store for 20 minutes, gazing at the array of e-book readers lined up on the counter. I felt myself aging ten years per second as I navigated between Nooks and Kindles, gigabytes and dual core processers. In the end, I decided I couldn’t take part in euthanizing the book industry, in which I one day hope to be a participant. My stolid on-site review of these devices led to an instantaneous reflection on the role of good, old-fashioned books in our lives. The cultural influence of the printed page is impossible to measure; once ink becomes a relic, the unintended consequences could be severe. Consider, for example, the obvious physical footprint books have on our topography. Some of our largest, most ornate buildings exist solely to house books; at some point, these libraries, bookstores and archives will simply serve as empty, cavernous remnants of the pre-digital era. On a personal level, many readers will miss the tactile sensation of leafing through books. Devout bibliophiles even like the pain they feel in their necks after perusing bookstore shelves with their heads cranked to the side in order to read the vertically oriented spines. They buy books they will never read, but feel better about having them on their shelves at home. They relish finding hidden treasures left in used books, whether they’re notes scribbled in the margins or clues to the previous book’s owner on a slip of paper used as a bookmark. The move towards digital books will also likely bring about the same type of information egalitarianism we’ve seen with the internet. 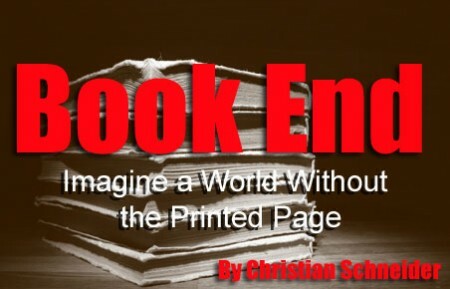 In the days of the printed word, publishing was more or less a meritocracy; if a publisher was willing to back a book with the type of cash it takes to print a few thousand copies, it meant it was at least a professional product. (Those that want to point out that a publisher actually issued a book penned by The Jersey Shore’s “Snooki” may have their say at this point.) It will be much more difficult sorting through texts that don’t bear a publisher’s imprimatur, since all one needs to be considered an “author” now is to be able to turn on a computer. Similarly, physical books grant authors eternal life. The literary world is replete with names of writers who received lukewarm reviews during their lives (Nietzsche, Blake, Thoreau), but who became posthumously indispensable. Emily Dickinson’s first compilation of works wasn’t published until four years after her death, when her sister found her secret stash of nearly 1,800 poems. Yet authors in the digital age are just a few “delete” button presses away from eternal extinction. It seems unlikely that there will be a day where books disappear completely. As long as there are wealthy people, rare books will be sold as commodities and held as investments. Middlebrow texts will become the realm of book fetishists, much as vinyl records are today. But once our cultural mores are untethered from the book standard, we could be set adrift in an age when everything is possible, but nothing is real. Of course, the primary beneficiaries of the new digital age are the stately trees and critters that live amongst them, who will not be sacrificed to the paper mills. But next time you see a squirrel, see if he can get Tom Wolfe to sign your Kindle.